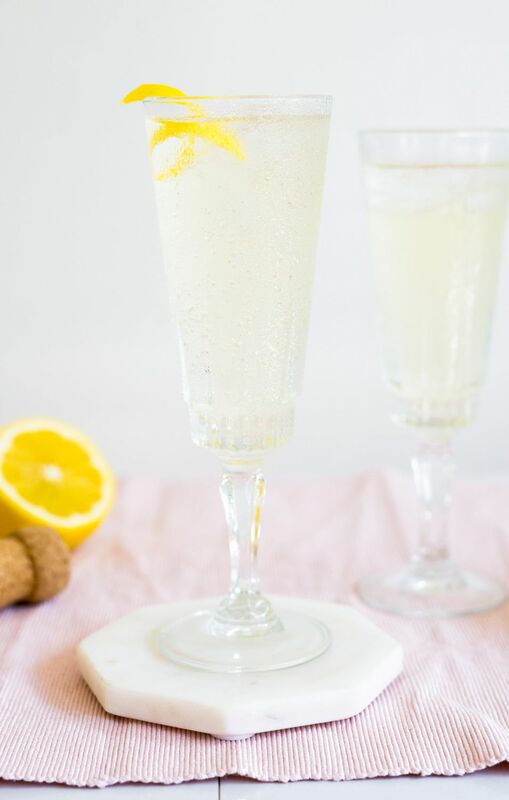 The French 75 is an old favorite in the cocktail scene. It is one of the most popular Champagne drinks you will find and a drink that everyone should try at least once. A timeless drink, the French 75 was created sometime around World War I and was named after the 75mm M1897 artillery gun used by the French military. American GI's caught on to the drink and brought it home. It was at New York City's famous Stork Club that the French 75 really became a hit and it has been with us ever since. At some point in its early history, this drink was made with Cognac in place of the gin. Gin remains the most popular base for the French 75, though there are now countless ways to make it. Pour the liquor, juice, and syrup into a cocktail shaker with ice cubes. Strain into a chilled Champagne flute that is at least half full of ice. It happens all of the time with the most popular cocktails: it seems like there are a million ways to make it! If you do a quick search, it is possible that you will not find two identical French 75 recipes. Every bartender has their own twist on it: some add a little more syrup or opt for granulated or powdered sugar, others take some of the bang from the drink by pouring less booze. Then, there is the question of which liquor to choose. Popular variations include the French 76 and French 95 and almost every spirit (including tequila) has been used in a French 75 over the years. How is a drinker supposed to choose? Very simple... try them all! Seriously, give each of these recipes a chance and see which one you like best. In all likelihood, you will enjoy one just a little bit more and end up putting your own personal twist on it. An Alternative French 75. Rather than use simple syrup, this recipe opts for Cointreau. It is one of the few recipes that makes this substitution and is not considered a 'traditional' French 75 recipe. To make it, mix 1 ounce gin or Cognac, 1/2 ounce Cointreau orange liqueur, 1/2 ounce lemon juice, and 4 ounces Champagne. A Cognac-Specific French 75. Stop the brandy versus gin debate and enjoy a recipe designed specifically for Cognac. Notice that both the lemon and sugar are reduced significantly to accommodate the darker spirit. This recipe is a staple at the famous New Orleans restaurant, Arnaud's. To make it, mix 1 ounce Cognac, 1/4 ounce fresh lemon juice, 1/4 ounce simple syrup, and 4 ounces Champagne. The French 76. If you hear someone asking for a French 76, you should know that vodka is the spirit of choice, so simply use it to replace the gin above. It is one of the most popular variations on the original recipe. There are many other ways to put the drink together and some even add grenadine. However, most often you will see the sweet and sour elements inverted as it seems many drinkers prefer more sour with their vodka. The French 95. If you want to switch over to whiskey, there is a French 75 for that, too! This recipe from Dale DeGroff's "Craft of the Cocktail" takes on the number 95 and bourbon is preferred. To make this drink, mix 1-ounce bourbon whiskey, 3/4 ounce simple syrup, 1/2 ounce lemon juice, and 4 ounces Champagne. Each of the recipes above is prepared in the same manner, only the ingredients have changed. The majority of the time, the French 75 is preferred over ice. A pour of 3-5 ounces of Champagne is normal and Brut is often preferred because it has a drier profile. London dry is the preferred style of gin. No matter the recipe, always use top-shelf spirits. This drink deserves it! Serve the French 75 in a wine goblet, flute, or sleek collins glass. Some drinkers prefer lime juice over lemon. How Strong Is the French 75? This cocktail got its name because it is a powerful drink. In the cocktail world, though, it is not the weakest drink as many of your classic martinis and Manhattans are almost twice as strong. The 2-ounce pour of gin would make the drink about 19 percent ABV (38 proof). The 1-ounce gin pour would make it around 15 percent ABV (30 proof). Who Created the French 75? There is as much debate over the French 75's origins as there is about which spirit goes into the shaker. Cocktail history has long said that Harry MacElhone, the Scottish owner of the popular Harry's New York Bar in Paris and author of numerous 1920s bartending guides, created the French 75. However, as the Gin Foundry points out, Harry credited Buck's Club in London as its birthplace in his book, "The ABC of Mixing Drinks." MacElhone has been known for (or believed to be, anyway) making great drinks including the Sidecar, Old Pal, Boulevardier, and even the Bloody Mary. It just does not seem likely that he created the French 75 because he gave credit to someone else. Then again, much of our cocktail history is (quite naturally given the subject) a bit obscured, so we may never know the real truth.